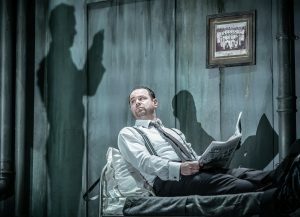 Pinter at the Pinter reaches its climax with Pinter Seven featuring an enigmatic and occasionally baffling radio play, A Slight Ache, and a real highlight in an already remarkable season, The Dumb Waiter. Martin Freeman has cornered the market in worried men. His brow furrowed, eyes darting this way and that, nerves jangling, unable to sit still, always asking questions. In The Dumb Waiter he plays Gus to Danny Dyer’s more confident Ben, a pair of assassins for hire who have been told to wait in the basement of what they initially thought was an abandoned Birmingham cafe for news of their latest assignment. In the claustrophobic, dungeon-like room, more a prison cell than anything else, Dyer and Freeman’s fast, familiar and occasionally surreal banter, keeps the audience on the edge of their seats. The conversation is funny, visceral, menacing and packed with so many layers that you’ll want to re-book to watch it all over again. The pair are incendiary. Gus is moaning about a lack of job satisfaction, he’s frustrated, in need of a cup of tea but there’s no money for the meter. He’s only brought a few provisions with him and doesn’t know if they’ll last. Ben’s trying to read the paper but is constantly interrupted. The pair discuss football, past jobs, the work, their situation. Suddenly their jabbering is silenced by the arrival of a food order in the room’s dumb waiter. Now what are they going to do? It’s a brilliantly written piece from Pinter at his best with two terrific performances by its stars. Dyer’s Ben is intimidating, full of bluster but an unquestioning company man who obeys orders implicitly. He’s thrown a curve ball by the food orders. It isn’t expected. It’s not according to the well-recognised procedure and, having to improvise, puts him on edge. Freeman is like a yappy terrier snapping at Ben’s feet. He’ll take orders but it’s why, why, why? Too many questions, not enough information. The dynamics of their relationship is familiar. They’re like an old married couple or any number of double acts from vaudeville to Hollywood. 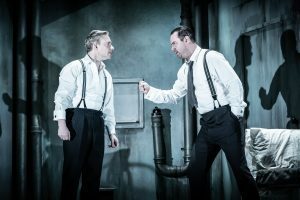 Dyer is a revelation and gives a blistering turn, nailing the rhythm and timing of Pinter’s punchy dialogue, using his burly physical presence to impose his will and keep Freeman’s prattling, anxious Gus in check. 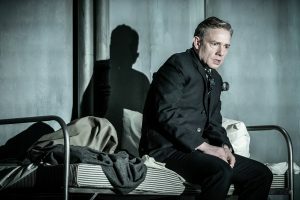 Jamie Lloyd, who directs both one-act plays, invests the taut production with lashings of mood and menace, with ominous shadows thrown up the walls of Soutra Gilmour’s stark set from Jon Clark’s tremendously atmospheric lighting. A Slight Ache is equally beguiling but overlong. Whereas The Dumb Waiter ended with an audible “Oooh” from the audience, this strange two-hander engendered more an “Eh?” from mystified theatre-goers. 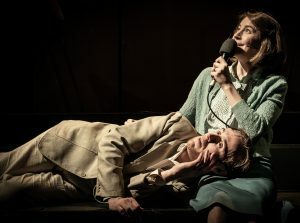 John Heffernan and Gemma Whelan play a couple of terribly well-spoken radio actors who are presenting a play. 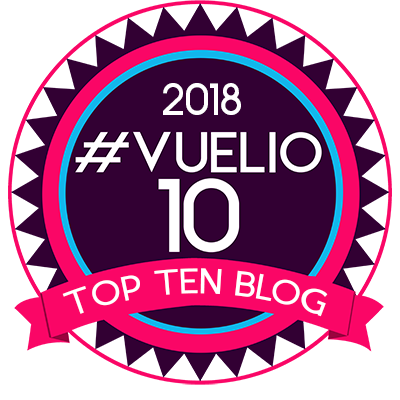 But the lines between reality and fantasy are soon blurred and the broadly written comedy element, occasionally sadistic and misogynistic, is replaced by a tale of paranoia and obsession that will have you scratching your head. Of course the Puckish Pinter made his name by offering up superbly written but often perplexing plays and it’s no wonder Jamie Lloyd is so fascinated with them. The entire Pinter at the Pinter season has been an incredible showcase of Pinter’s unquestionable talent and a remarkable achievement of its artistic director. It finishes on an undisputed high with The Dumb Waiter. Pinter Seven plays at the Harold Pinter Theatre until February 23. 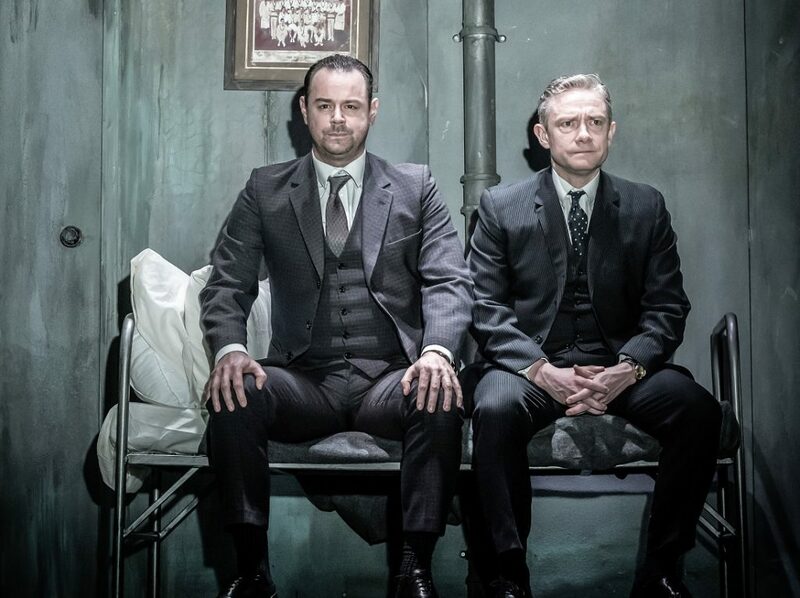 Danny Dyer & Martin Freeman make a winning double act as assassins questioning their job satisfaction in the Pinter Seven climax, The Dumb Waiter.